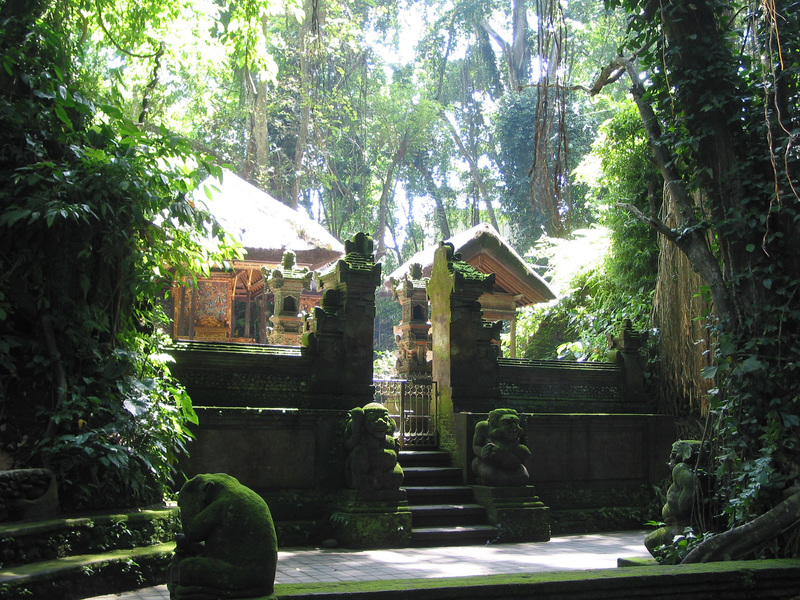 On my morning walks when I vacation in Bali I often pass the Sacred Monkey Forest Sanctuary, dedicated to an understanding of the balance and harmony among humans, nature and the world of the spirit. It is a stunningly beautiful space of peace and serenity. In the forest live about 700 raucous and often entertaining monkeys who travel freely through it and who inevitably overflow into the neighboring streets. They can also, at times, be quite aggressive and threatening, especially if there is some sort of human interference in their movements or if one is carrying some food or if they perceive any sort of threat. 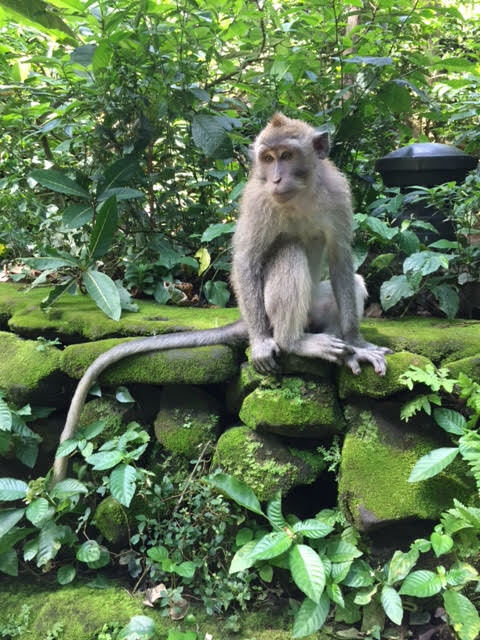 My walks in or near this serene forest – and the inevitable encounters with monkeys of all sorts of dispositions – requires some mindful awareness and skill. Like meditation. In our meditation practice, we regularly hear beautiful and wholesome instruction on presence, on peace, on mindfulness, on concentration. “Be here now.” When we sit on our cushions, however, we can easily despair. Our internal monkeys are out. Our thoughts and emotions, our views and preferences flock through with urgent appeal and our minds are easily unmoored. Our teachers make vivid reference to monkeys swinging through the trees or to the internal flocks of birds which so easily startle off into flight. We recognize the images. “Let them go,” we are instructed. And yet each one of us may secretly believe that our teachers don’t really know just how many monkeys we have or how tenacious and aggressive and persistent and downright rowdy our own personal troops of monkeys and flocks of birds can be. How to navigate? For starters, it is crucial that we understand the difference between “mind” and “mind” and to understand what we mean by mindfulness and concentration. It is easy to misunderstand. Sometimes the word “mind” in our teaching does refer to the contents of the mind: the things that we think about, driven by the connections of neurons in our brains. Those are the monkeys and birds: the thoughts and images and perceptions and sensations and emotions that flow through the brain. These thoughts and images and perceptions and sensations and emotions come and go with neither our bidding nor our control. Like monkeys and birds, these thoughts and images and perceptions and sensations and emotions cannot be managed by making thoughts or emotions or perceptions or images the adversary and then by overpowering them or ridding ourselves once and for all of their chatter. The same thing works externally: we cannot manage “good stuff” or “bad stuff” by squashing it. Or rather we can. Sort of. We could (mis)use meditation to try to space out or to blank out, either internally or externally. Some people are pretty good at this. Or, we can (mis)use western psychology to imagine that the challenge is to perfect some control of the monkeys in our minds, to tidy them up, make them behave or to ultimately improve them according to our own ideas: to change the nature of monkeys. However, we cannot ultimately make our minds peaceful by criticizing our minds or thoughts or emotions or images or perceptions or criticizing ourselves or others… or by controlling them or by making monkeys and birds…. wrong, somehow. Monkeys are monkeys and birds are birds. They are not the enemy. Meditation invites us into awareness. This is a different meaning of the word “mind.” Awareness. Mindfulness. “It’s like this now.” The challenge of mindfulness is to rest in awareness, to know the contents of the mind. To cultivate the capacity to place our awareness non-judgmentally in this wholesome place and for it to remain (return) there, no matter what contents arise. There are many metaphors in the teachings. Ajahn Lee compares this skill to the skills of building a bridge in the midst of a turbulent, ever-flowing river. The Buddha’s teachings say that the bridge is supported on one shore by a pillar of sila: virtuous habits and action. It is supported on the other side by a certain level of panna, wisdom: what we develop by listening to teachings and reading and then reflecting in our own lives and seeing directly in experience how it lives in our bodies and minds and hearts. The hardest part of planting bridge pillars, however, is in sinking the middle one into the ground: the pillar that is going to be a primary support for the bridge when storms come, when 100-mile hurricane winds blow and waters rage and push and pull at it. That pillar has to be deeply planted and strong. That image refers to the different meaning of “mind:” not the contents of the mind’s activities – the birds and the monkeys themselves – but a larger awareness that can know the presence of rushing water or birds and monkeys and remain steady, no matter what. That is the mind that we train in meditation. For me on my morning walk, practice with the wild forest monkeys requires a similar awareness and the practice of rather simple skills. I need to not be surprised or take personally that I will certainly encounter monkeys and that is not a particular fault of either myself or the monkeys. It’s how life in the forest works. I need to remember my intention: to have a happy morning walk and to not be detoured by either fascination or injury. I need to stay committed to that intention, regardless of how agreeable or disagreeable they are. This means that I don’t carry bananas or sweet potatoes with me, I don’t initiate engagement too closely and I stay calm if the monkeys decide to jump on my anyway. Soon they will be bored with me and leave on their own. Similarly, mindfulness is about cultivating the capacity to be aware of the contents and the movements of the mind without being overcome or being controlled – consciously or unconsciously – by those movements. When our skill with mindfulness and concentration are not yet stable, we can easily be swept away by internal and external sensations and storms. We can get swept away by thoughts and emotions from the past, by mental confusions in the present, by anxieties and projections about the future. As we orient more and more to “big mind,” there still is awareness of movement and action but it is a knowing that arises from a deeper, more calm and steady space from which wisdom can emerge. So, Samadhi, wise concentration, is the steady cultivation and practice of this quality of mind. 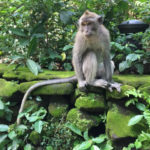 It is not about monkey genocide or about sequestering ourselves so that we are not aware of monkeys – our own or others’. It is about being able to have a stable mind and heart: peace and freedom to choose wise and wholesome action in the midst of all of the worldly winds. A mind that is not controlled by the storms within of greed, hatred and delusion. A mind that is not tossed about externally by the worldly winds: praise and blame, gain and loss, pleasure and pain, fame and obscurity. It is skill with this mind that we are invited to practice: cultivating a resting in the sweet peace of sacred mind that is unsullied by the movement of these superficial flocks of birds and these capricious troops of monkeys.